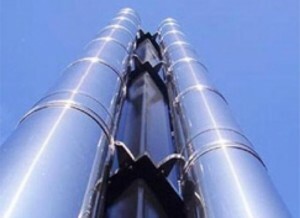 Flues | Pak Plant Ltd. The core product range of chimneys, flues and exhausts, which includes a range of natural lighting and venting solutions, as well as a wider range of chimney options. This includes free standing, open lattice, and single support mast chimneys. We can also supply specially insulated flues for the extraction of waste gas products from boilers, generators, CHP units, cremators, incinerators and bio mass boilers.